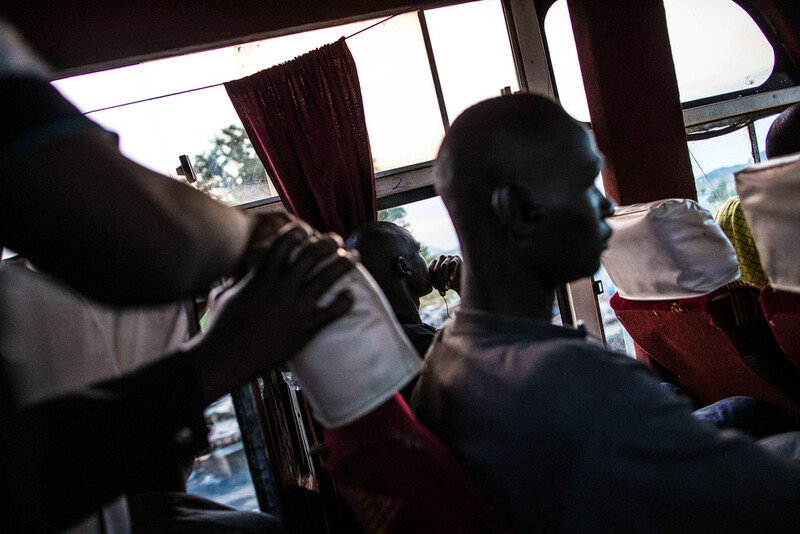 It’s just after 6 am – that muted hour before the sun breaks and light stirs the day into focus – and our Kampala-bound bus has made it out of Juba, the hardscrabble countryside of South Sudan now undulating out to the horizon. Okelo, the head coach for a South Sudanese kickboxing team, is on the road with seven of his fighters to a competition in Kampala and is discussing the mentality of the South Sudanese. I’ve decided to tag along. The bus hurls itself towards Uganda, but the recently finished road – one of South Sudan’s only paved thoroughfares – allows the engine’s churn to be an almost calming drone. Puro and I sip the sugary coffee we bought back in Juba’s pre-dawn darkness, the flimsy white plastic cups sticky from the liquid heat. We’ve got 10 hours to Kampala, maybe more if the roads are washed out south of the border. 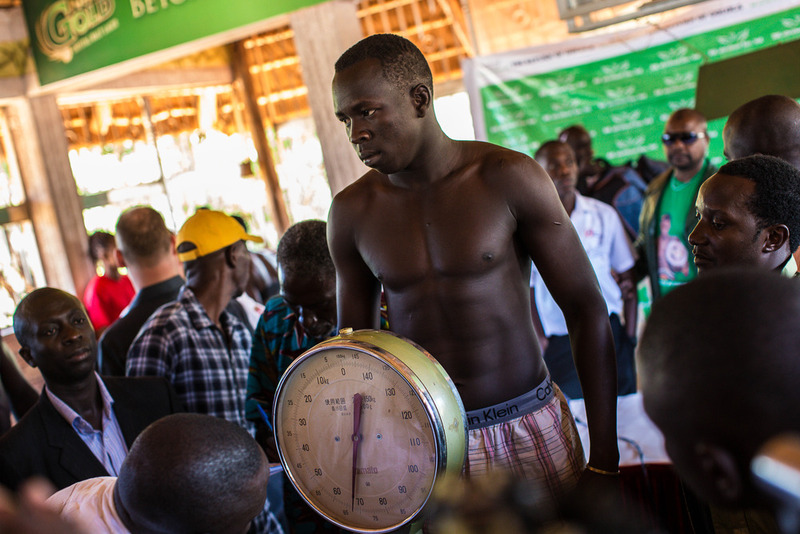 The fight we’re headed to in Kampala is centered around a well-known Ugandan kickboxer so Okelo’s team is a backseat attraction, if one at all. Questioning why he and his team are traveling so far and spending such limited resources for a competition that barely involves them, Puro tries to help me understand. “You see these kids?” he says, flicking his head back to the lanky fighters sprawled out asleep in the seats around us, “many have nothing. Nothing. They haven’t even had the ability to dream.” But I still don’t quite get it. A few hundred extra dollars saved from forgoing the trip would be a big help at his training center in Juba. Puro occupies one of those hard-to-define places that come from living in many places and pursuing many things. “I’m a human. I’m an African. I’m nothing and everything. I’m a person like everyone else,” he says. Born in the small town of Gambela on the border of what was then Sudan, he’s lived all over since childhood – Gambela, Addis Ababa, Juba, Nairobi, Ontario – and has worked in everything ranging from professional kickboxer to security guard to electrician. 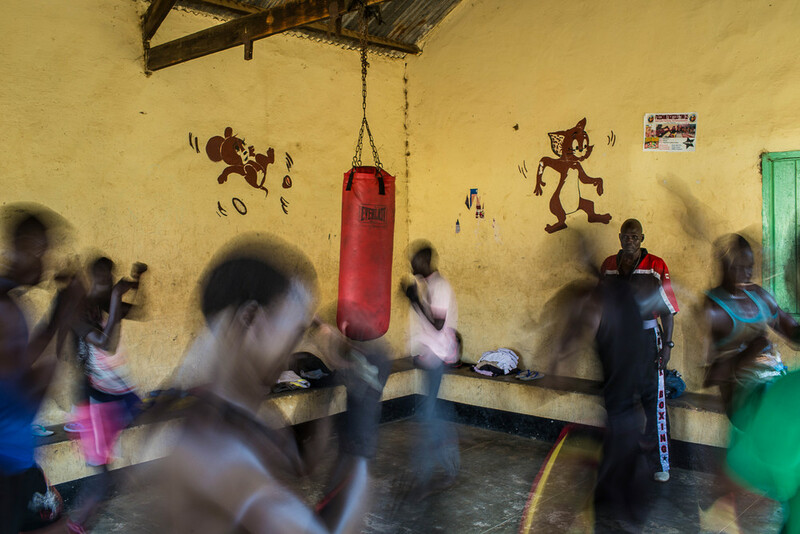 After years of refuge in Canada, he decided to finally return to Juba in 2008, a place he left in the late 80’s, and bring the sport of kickboxing with him. The road has not been easy. He doesn’t receive any support from South Sudan’s Ministry of Sports and Culture (he’s petitioned multiple times) and has to scrape together whatever funds he can from friends and family. Occasionally he’s able to eek out small donations from western boxing companies that have helped him fund trips and bring used boxing equipment from Canada. 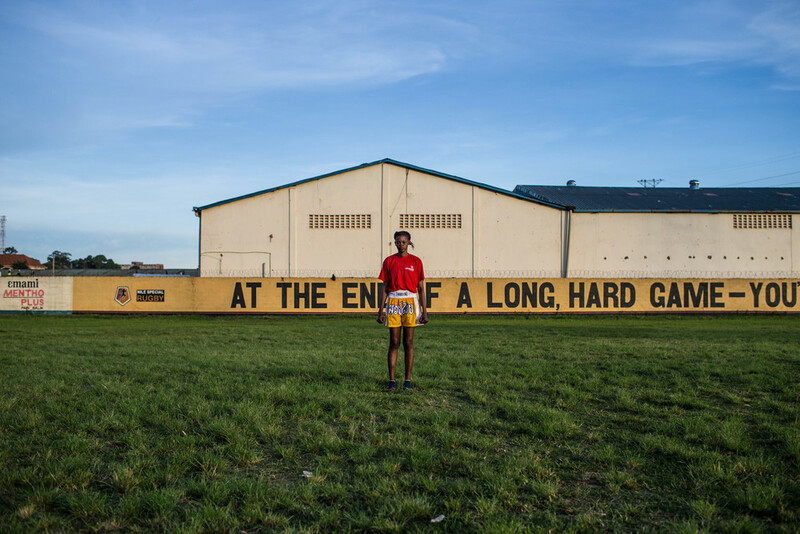 His team trains almost every evening in a small outdoor youth center that Okelo also calls home. His center trains more than 100 members who come when they want, although there are 20 or so regulars that form the core – seven of which have been selected for the trip. Of those seven only 28 year-old Adut had been out of the country at the time of this trip. Puro’s dreams for the team are endless. He wants to make them champions and have them travel the world, but says he’s fine with anything in between. We soon reach the border with Uganda and the pavement and soft morning light give way to rutted mud tracks and a sharp heat. 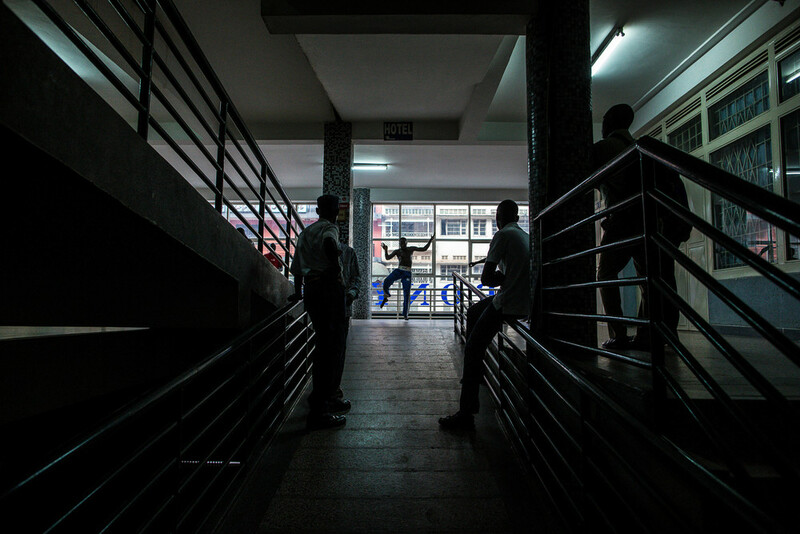 As we pass immigration and cross into Uganda, the lethargy of the morning transforms into a palpable anticipation with frequent bursts of giggles from the fighters. “Ohhhh this is good!” cheers a fighter named Abayok when half the passengers are thrown to the right side of the bus, an explosive clap echoing from the chassis as we bottom out in a hole that could be described not so much as a pothole but as a large area where the earth ceases to exist. “Today we are kings!” he laughs. Over the next three days I grow to understand that he’s not joking. That in fact the bone-jarring bus ride doesn’t matter. That neither our sparse dinners of papaya and pineapple, the dismissive tone of the organizers, nor the fact that only three will end up fighting matter either. That in the end the fight isn’t really what’s important at all. It’s the team, the trip, and the fact that they are important enough to go – somewhere, anywhere. It’s the hours spent laughing in their very own hotel rooms, or walking the streets of a foreign country’s capital because they earned it and because someone chose them. It’s feeling a part of something, and bigger than oneself. It’s feeling bigger than they thought they could. 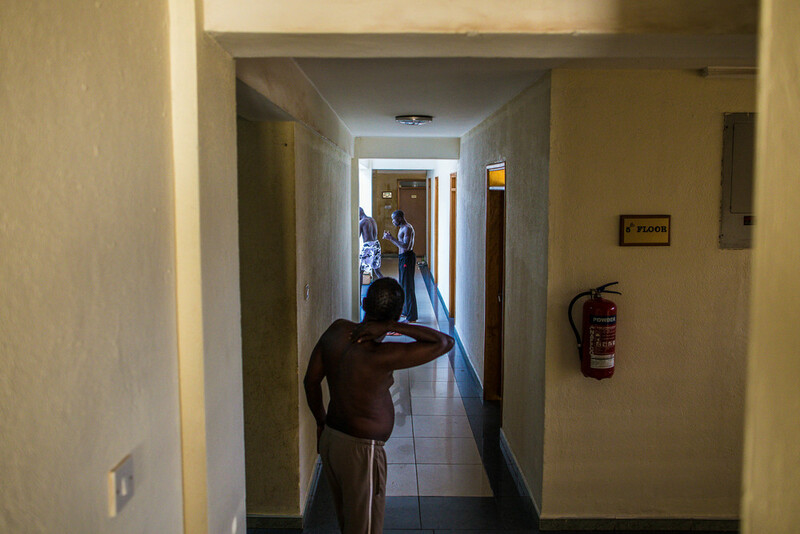 Since these photographs were taken South Sudan has spiraled into civil war. Many thousands have died and more than a million have been displaced from the ensuing conflagration. While Puro’s center in Juba was initially shut down due to insecurity, it has since reopened and Puro has kept on teaching and training anyone still willing to come.